Enjoying lean beef in a heart-healthy lifestyle is easier than you think with these recipes featuring lean beef, fresh fruit and vegetables, and whole grains. These Beef. It’s What’s For Dinner. 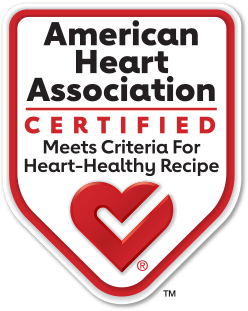 recipes are all certified by the American Heart Association®. Slices of cucumber are topped with beef Strip Steak, herbed cream cheese and a spicy Asian Sauce. This Beef. It's What's For Dinner. recipe is certified by the American Heart Association®. This appetizer recipe is perfect for your upcoming holiday parties. Flavorful steak meets cream cheese and a tangy balsamic sauce. This Beef. It's What's For Dinner. recipe is certified by the American Heart Association®. Beef tenderloin roast served with Brussels sprouts and a tangy cranberry sauce. This Beef. It's What's For Dinner. recipe is certified by the American Heart Association®. This beef flank steak is served with rice, vegetables and seasoned yogurt sauce. This Beef. It's What's For Dinner. recipe is certified by the American Heart Association®.